36a. [Guideline for testing watermelon ripeness? ], RULE OF THUMP. 43a. [Whence slouches? ], SLUMPERLAND. Meh. 58a. [Title of a trash collector’s memoir? ], DUMP AND DUMPER. A double change for the last themer. Better than a B-to-P letter-change theme with variable vowels, but there’s not any particular rationale for the wordplay. No revealer or title to explain that. I wonder if the constructor envisioned 17a INNER PEACE and 65a PLAY IT SAFE as quasi-thematic? “Inner P’s,” baseball umps giving a “safe” call on a play? Probably not, given that the fill crossing the 10/13 stacked entries is not grievous, and it likely would be if those 10s were chosen to be thematic. 41a. [Barrage in battle], SALVO. This was making me think of the Spanish show on Netflix called Money Heist, and I wasn’t sure why. Just realized it’s that one of the lead characters went by Salva (short for Salvador). Anyway! You could do worse than to go binge Money Heist. I’d never seen a TV show set in Spain before, but this is terrific. Can’t wait for next year’s third season! 47a. [Actress Mallet of “Goldfinger”], TANIA. I suspect 95% of solvers don’t recognize this name. I sure didn’t. 29d. [Apple application that’s now banned], ALAR. You really thought this meant a mobile software app, didn’t you? I sure did. It’s a pesticide spray (if I recall correctly) that was banned for its toxicity or what-have-you. 3.5 stars from me. Bits like STK and ADZ tugged the rating down. Hey! It’s Team Fiend’s very own Jim Q. in his WSJ debut! Congratulations, Jim! He brings us a chuckle-worthy theme featuring phrases that started out with an apostrophe-S, but undergo an apostrophectomy while having the S transplanted to the following word. I’ve seen themes which do the opposite of this, but I don’t recall one doing this before. Oh, and furthermore, spellings and meanings are changed as needed. 24a [Jeer from a nicotine addict?] SMOKER SCOFF. Smoker’s cough. Dude, this is life in the Pacific Northwest right now with wildfire smoke filling the air. I am sitting in my car with the windows open waiting for my daughter (at her therapy appointment), and, literally, flakes of ash are falling on my computer. Nothing to scoff at. 34a [Symptom of an apian allergy?] BEE SNEEZE. Bee’s knees. Love this one! Aww, poor widdle bee has got a widdle cold! 59a [Show of exasperation from a national emblem?] EAGLE SIGH. Eagle’s eye. Umm. 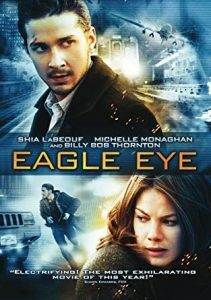 I’ve only ever heard “eagle eye,” so this one missed the mark for me. Googling the phrases in quotes returns 9.6M for the adjectival “eagle” and 351k for the possessive. However! One just has to look at the state of this country (and its rollback of environmental policies and air quality in particular) to easily imagine eagles giving a resigned, collective sigh. One shouldn’t be surprised if they go into outright revolt and demand removal as this country’s national symbol. Wow! For a fun theme, this sure brought up a lot of hot-button issues! Still, I really enjoyed the wordplay. I thought the grid was off to a rough start when 1a‘s [Many a Julliard student’s warm-up] had me filling in crosswordesey ETUDE right off the bat. I was glad to have to change it to SCALE later on. And I’m not sure I’ve ever seen CLOUTED [Hit hard] before without the ear being involved. So would a [Smacked big cat?] be a CLOUTED LEOPARD? There isn’t a whole of dreck here, a RIA, an ALGA, a UTE, etc. but nothing too bad. However, there are stacks of fun fill in the corners. I like the lively “ANY NEWS?’ and “NO HURRY” along with KISS CAM, TAGLINE, SLUGGER, and YAMAHAS. 14a [People hold them in their arms]. ULNAS. Cute way to clue the old stand-by. I’m not entirely sure about the “holding” part, but I like the fresh approach. 23a [Tribe that lent its name to a state]. UTE. I’m not entirely sure about the “lending” part, either. Kinda like their land was “lent” to the state, as well? Oh look, another hot-button issue! 26a [“Feed the kitty” sound]. MEW. Nice misdirection. My first thought was cats, then poker, then back to cats again. 32a [Theology subject]. SIN. See my little rant above. Seriously, I guess those guys missed this subject in seminary. 55a [They may be called to fix a flat]. SUPERS. Another good one. My first thought was TUNERS. Is “flat” used anywhere in the States to refer to an apartment? Because I really doubt that SUPERS is used anywhere outside the U.S. to refer to building managers. I thought this was a thoroughly fun debut despite a few issues here and there. 3.7 stars from me. 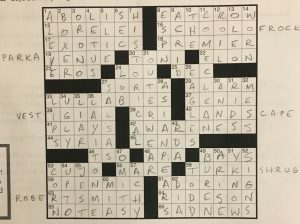 This week’s AVX puzzle from Anna Gundlach was released a little early at Lollapuzzoola 11, so I got the chance to solve it on paper on the bus back to Boston. That means I wasn’t timing myself (or in best form to do so), but it did mean I got to savor what turned out to be a really lovely puzzle. The AVCX has featured clothing-themed puzzles before, but I don’t really care about whether something’s been done before when it’s executed this well. Around the time I hit ROBERT SMITH in the grid on my first pass through the across clues and realized what was going on, I had a great AHA moment with this. Figuring out that PARKA was the last bit of OUTERWEAR (21D) to turn VENUE into PARK AVENUE was the last bit of solving I needed to do to call this one done. ABOLISH ICE. That is all. I love that in the time between this puzzle’s construction and this last weekend, ELON Musk may no longer be dating Grimes. If you know who both of those people are: don’t worry about it. If you don’t know who both of those people are: don’t worry about it. 4.5/5 stars. Great construction supported by solid fill. CUTTINGTHECORD is a lively revealer to an otherwise run of the mill theme type. I’d have preferred a medical angle on that clue, but in the U.S. this phrase as clues seems to be very au courant. 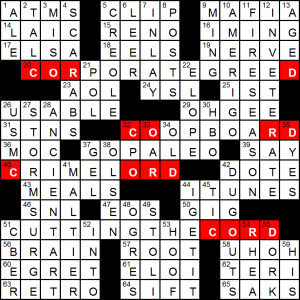 The entries hide CORD bookended 3 ways. CORPORATEGREED googles a lot better than I thought it would; I’m not entirely sure if COOPBOARD is “coop” as in chicken coop or co-op – not a term I’m familiar with. CRIMELORD is solid enough. [Adopt a caveman diet], GOPALEO. Is this an in the language phrase with go? [“Oorah!” org. ], USMC. Is that the preferred spelling then? I’ve seen several variants. [Where bats hang out? ], DUGOUTS. Baseball, if you were still confused. This entry was posted in Daily Puzzles and tagged Anna Gundlach, C.C. Burnikel, Jim Quinlan, John Lampkin. Bookmark the permalink. AVX: Completely delightful puzzle–even though I couldn’t suss out one of the “wraps.” Thanks, Anna. It was a fun puzzle! 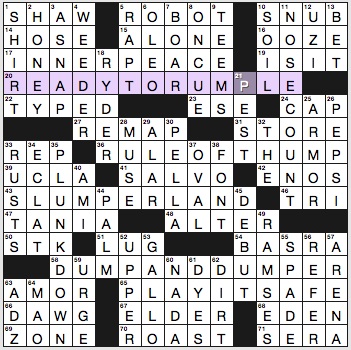 I was getting all annoyed about having that gimmick in a Wednesday puzzle and then realized it wasn’t the Times. Good morning. A “shrug” is a type of sweater. Does that help, David? Or was it one of the others? I’m actually not sure if 19A is correct anymore. Thanks. Not knowing what a SHRUG was really made the southeast tough for me. AVX: Learned something today: “take the L” for “eat crow.” Before filling in all the down answers, I was search for a phrase for taking the train in Chicago. 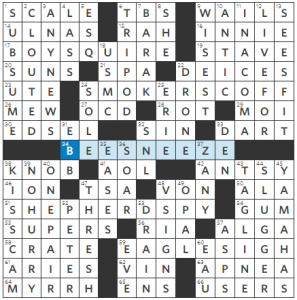 Also, I enjoyed 63-Across because I still listen to The Cure. NYT: I wonder if the word “lambkin” had anything to do with today’s NYT theme. During the mid 90’s I was living next door to a rather staid piano teacher. One day he came over & asked me if I wanted his old piano because he was buying a Yamaha. I immediately thought he was buying a motorcycle & thrilled he was getting loose. I never thought of Yamaha as a motorcycle again.